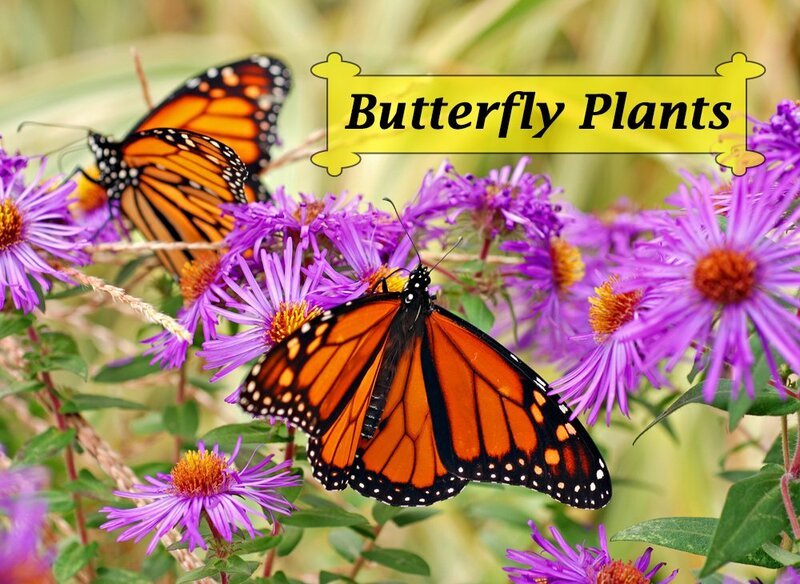 This frequently updated butterfly plants directory makes it easy for you to find the nectar flowers and host plants you’ll need to create a bountiful butterfly garden. 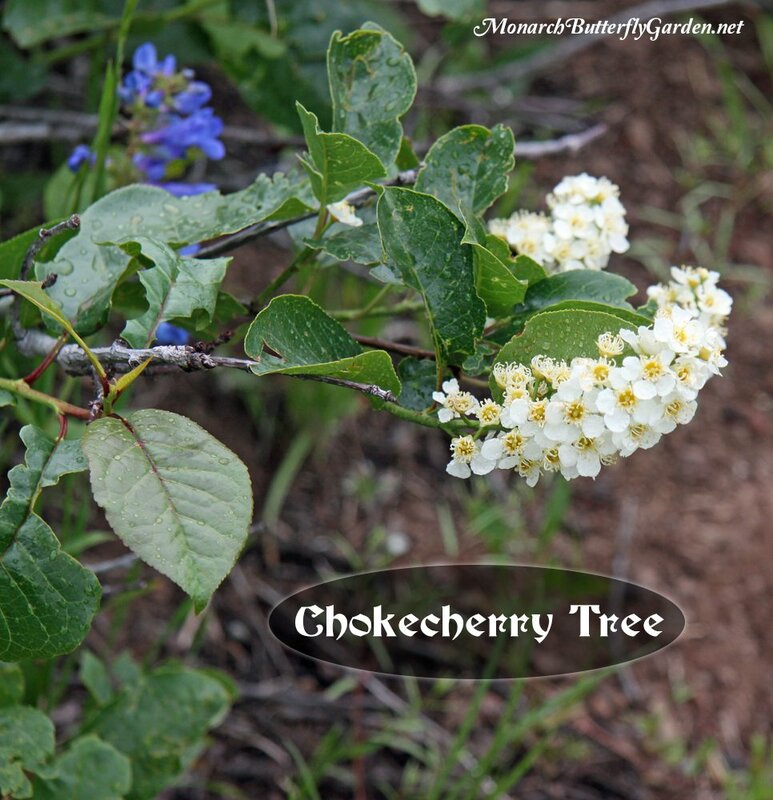 Find western butterfly garden plant ideas here. 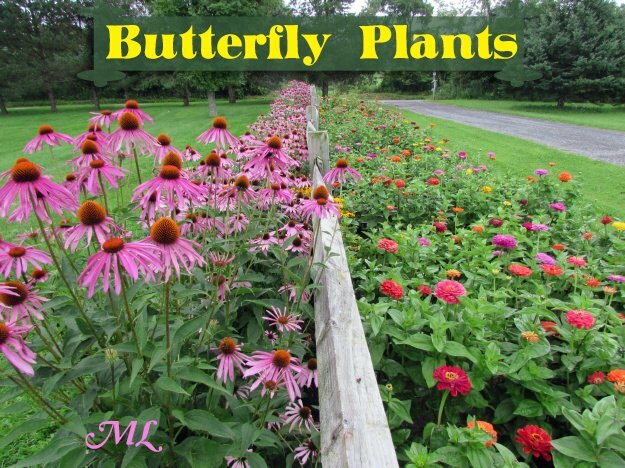 Most of the butterfly plants listed below attract monarchs but some will also attract other butterflies, hummingbirds, bees, and moths. These are the plants and butterfly flowers (both native and non-native) that have attracted the most butterflies to our garden and to other gardens across North America. This also includes host plants to feed butterfly caterpillars. 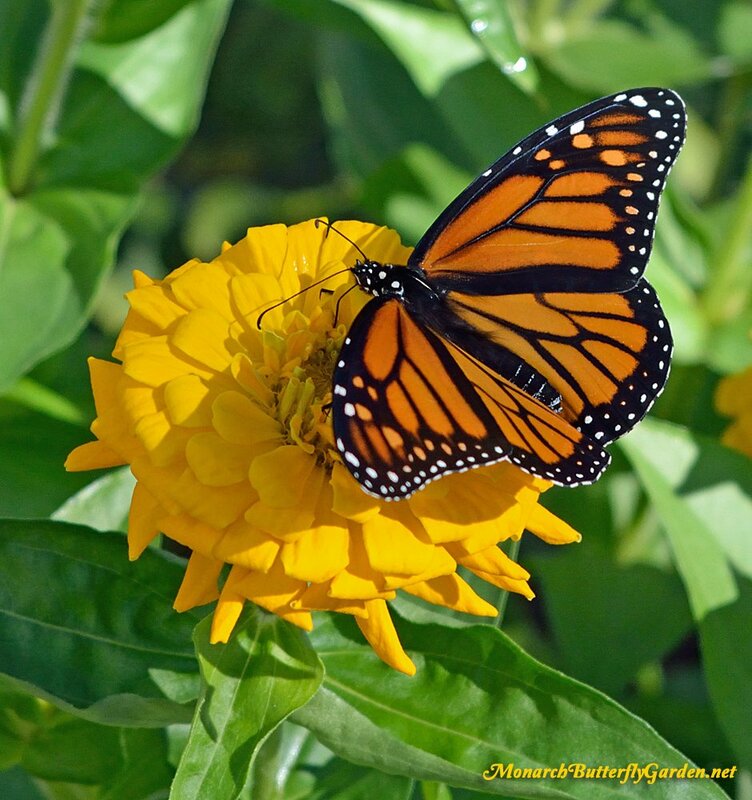 While non-natives aren’t suitable for planting in unattended fields, they most certainly have a place in home gardens where they can be monitored…and you’ll attract and support more monarchs and pollinators with a thoughtful mix of both natives and continuous blooming annuals. 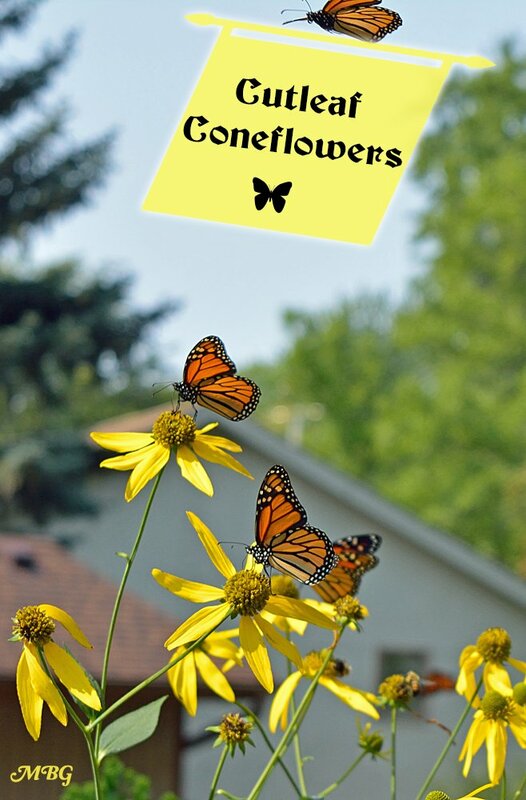 You can purchase seeds or butterfly plants by clicking on any of the bold orange links on each listing below. Regular orange links go to plant pages with more photos and info. Porterweed comes in a variety of colors but blue seems to be the color that attracts the most monarchs. Overwinter in cold climates. 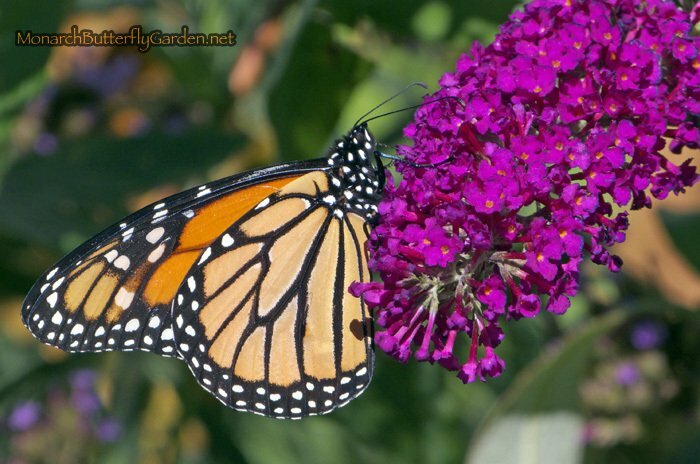 There are many butterfly bush cultivars to choose from. But the following have two things in common…they attract butterflies without being invasive. If you consider other varieties, make sure they aren’t invasive plants for your region. Buddleja Buzz is compact, non-invasive and it attract butterflies. It’s also supposed to be more cold hardy for the north. It’s the only variety we’ve planted that hasn’t succumbed to Minnesota winter. Colder climates should mulch with leaves in November. Buzz comes in a variety of colors including purple, sky blue, and white. Grows to 4 feet. Get more info and garden photos on our Buddleja Buzz Plant Page. This proven winner is also a non-invasive variety that butterflies love. It’s as close to a true red as butterfly bushes get. It’s a more compact variety that tops out around 6 feet. There are several types available including ‘blue chip’ and ‘lilac chip’. ‘Purple haze’ has a a lower growth habit on horizontal branches. I hear mixed reviews about ‘lo and behold’. While these compact plants take up less space, some gardeners report fewer butterflies. These buddleia are almost sterile, and won’t present any seeding issues. Tops out at just 3 feet…a potter’s delight! 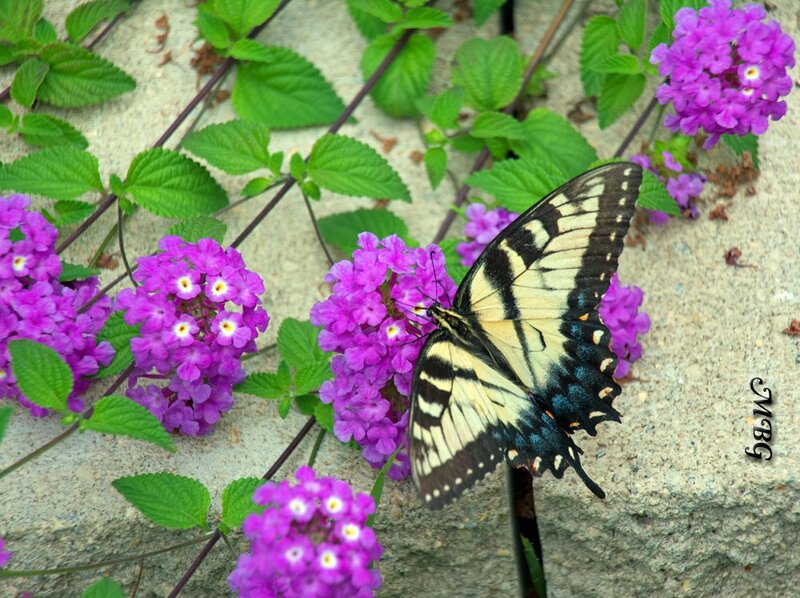 Butterfly vines can provide visual appeal, and even serve as a garden centerpiece when you find one with spectacular leaves or butterfly flowers. They also make it easier to view the butterflies! This butterfly vine must be overwintered indoors in colder climates. 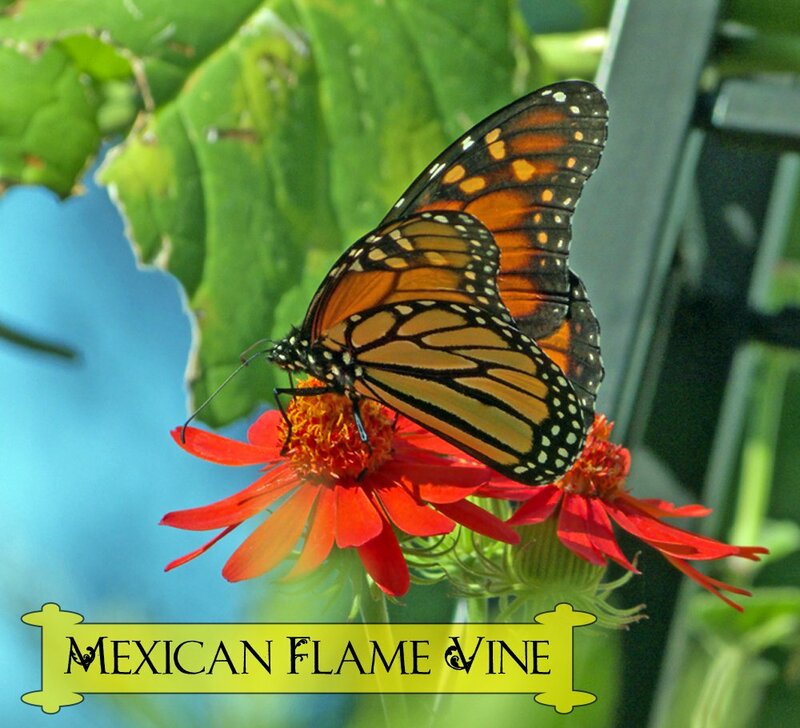 The vibrant orange blooms on this climbing vine are one of the best (and only) vine flowers that attract monarchs. It also attracts swallowtails, hummingbirds, and bees to our northern butterfly garden. 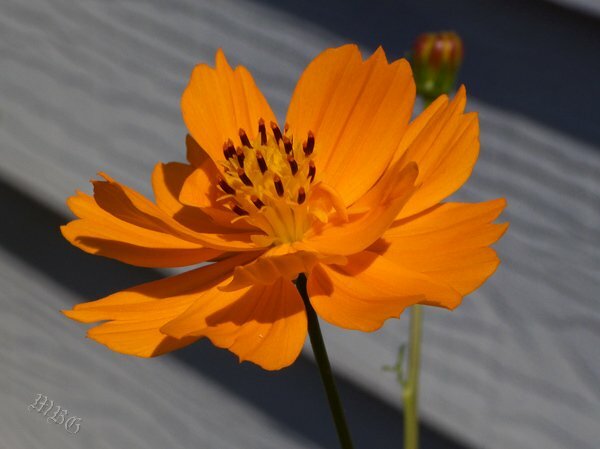 Mexican sunflowers are one of the top annuals you can add to your butterfly garden. 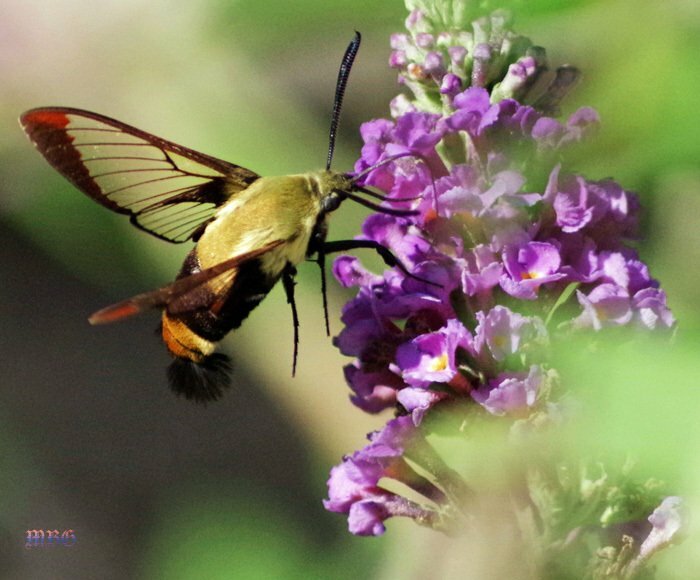 They attract many butterflies and hummingbirds with their vibrant color and sweet nectar. If you want to attract migrating monarchs, this orange butterfly flower should be on the top of your list. Long-blooming, brilliant orange flowers that will intoxicate both you and your butterfly guests. You can’t ask for much more from this long-blooming ornamental allium. It’s a pollinator magnet, repels aphids, and the flowers are sterile so it won’t spread to unwanted areas. 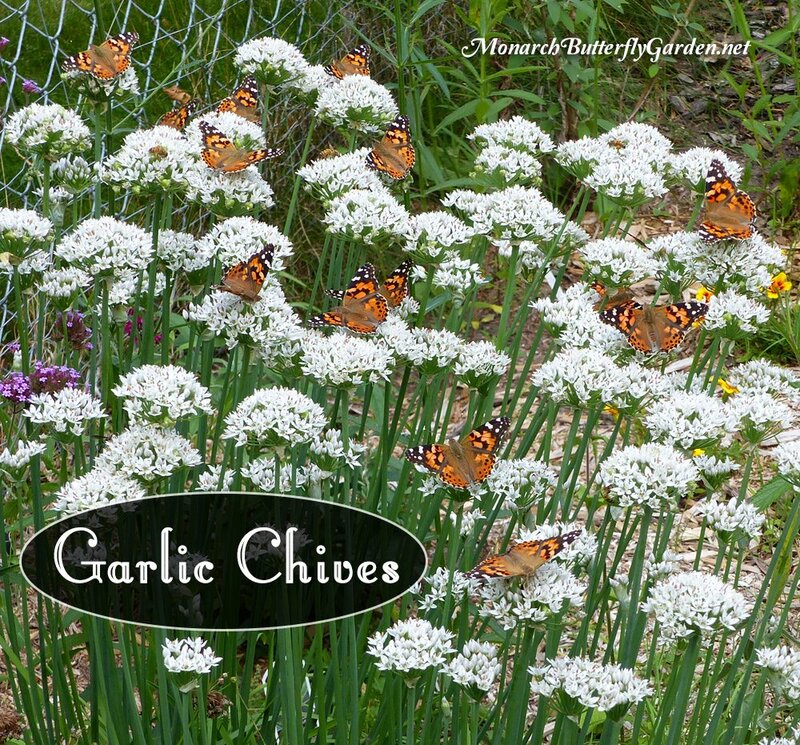 The best allium species I’ve tried for butterflies. 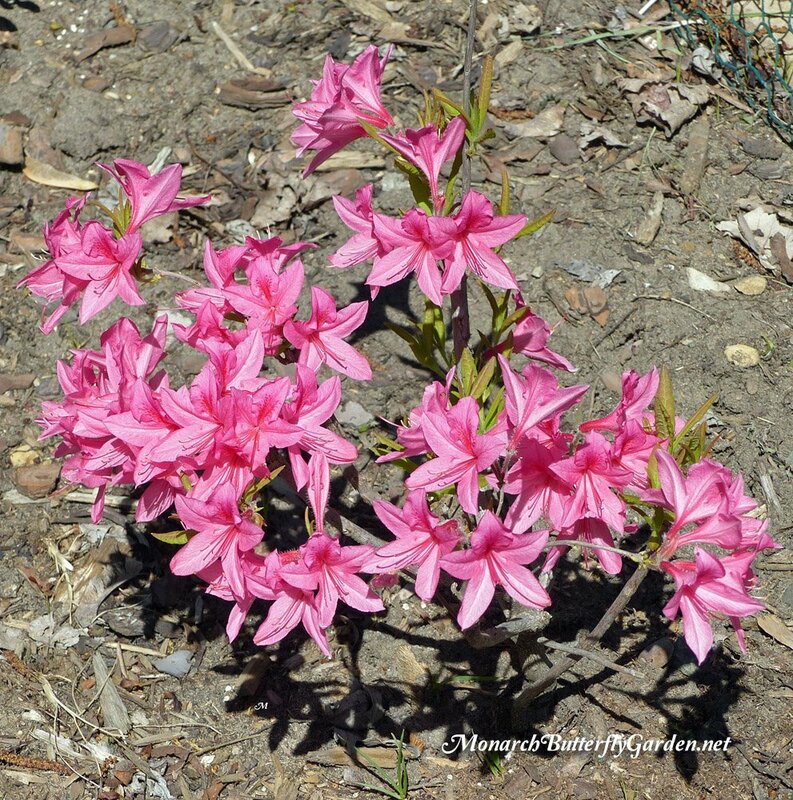 Azaleas or Rhododendron come in a variety of colors including purple, yellow, red, white, and this vibrant shade of pink. 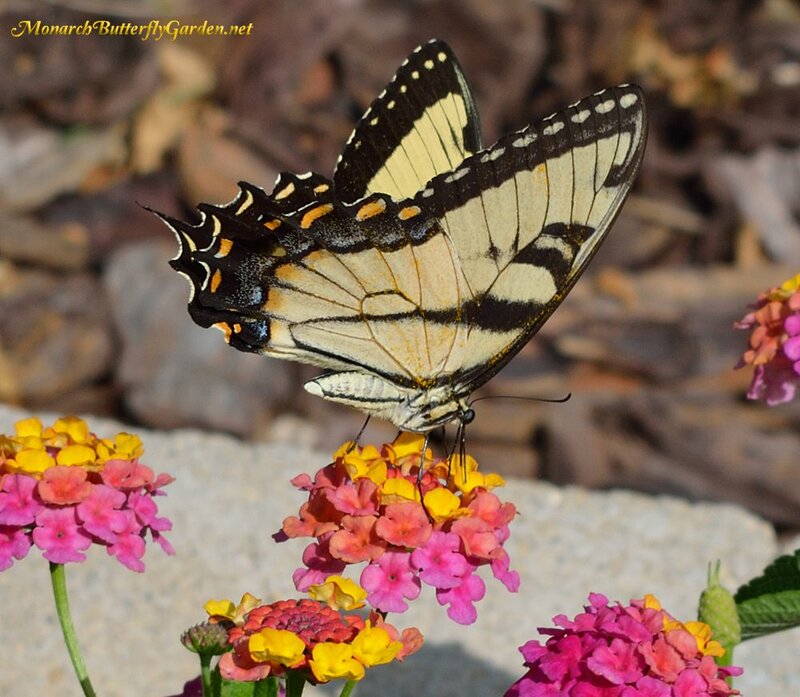 The flowers attract spring butterflies, including swallowtails. The pale purple coneflower is often mistaken for the more familiar echinacea purpurea, but E. Pallida has distinctively thin and weepy flower petals. Butterflies, including painted ladies, are common visitors. Don’t be fooled by the common name, the flower petals are most definitely pink! 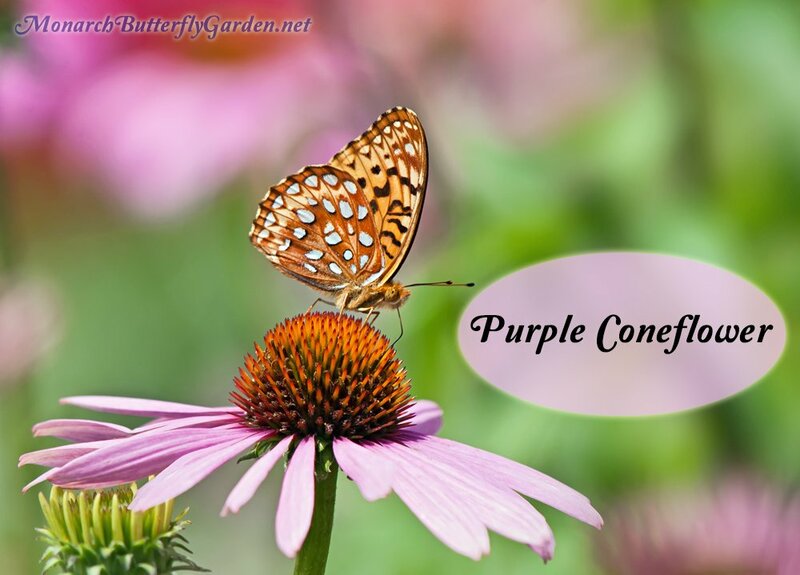 Purple coneflowers are a worthy butterfly garden staple across the eastern half of the US. The flower petals are a soft pink hue defying the expectations of their common name. There are many cultivars of this variety, but the native variety seems to attract the most pollinators. 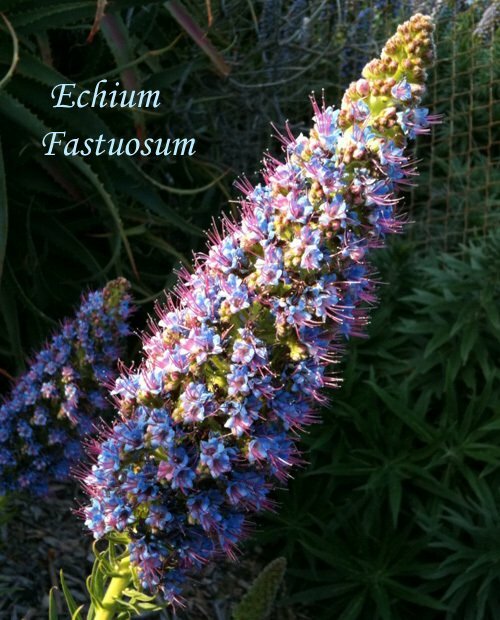 note: The botanical name has been changed from Eupatorium to Eutrochium. 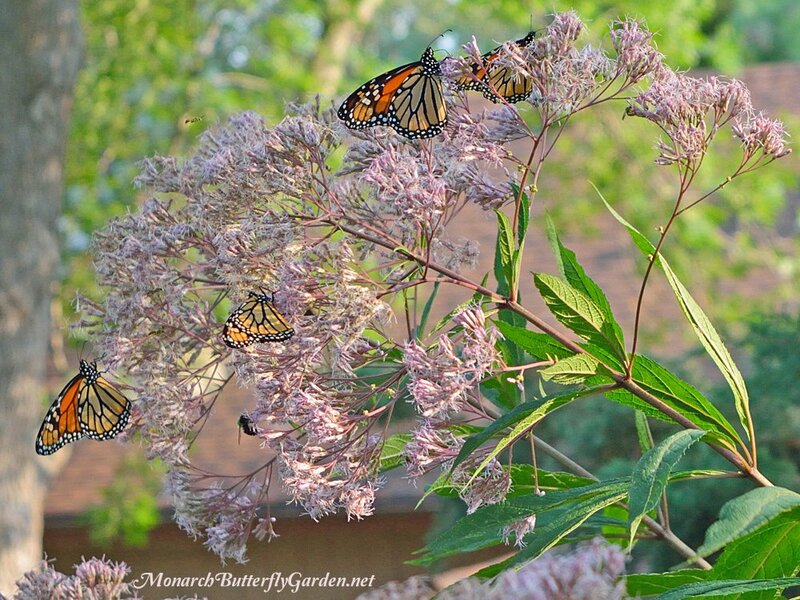 Spotted Joe pye weed is a low maintenance butterfly plant thrives in full sun to partial shade. This is an extremely popular nectar source up until the monarch migration. See more ‘Joe’ photos and info here. 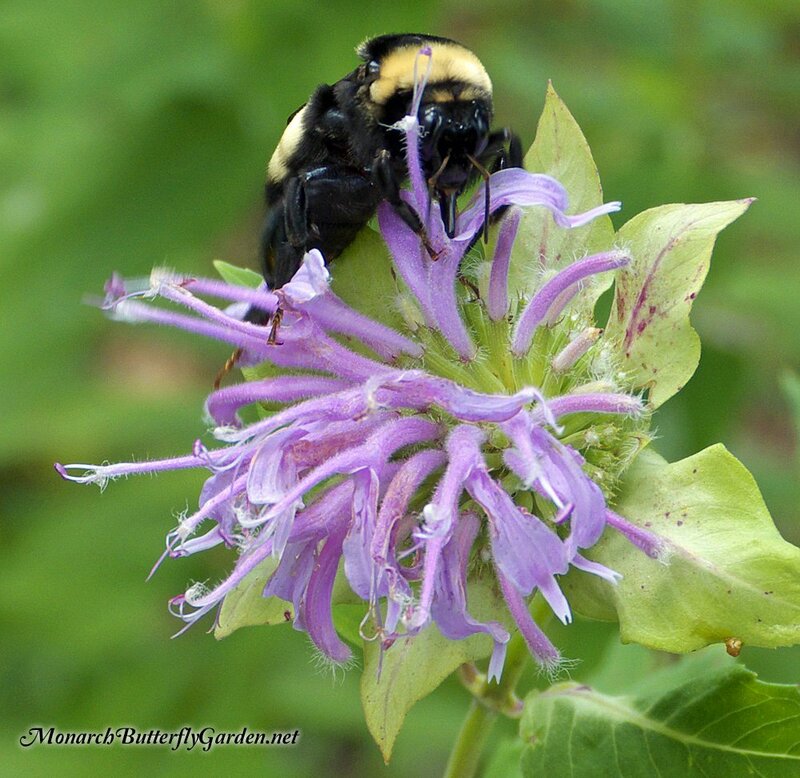 note: This butterfly plant has two common names: wild bergamot and bee balm. Wild bergamot entices a wide range of butterflies and other pollinators. It typically grows 2-4 feet tall and puts forth pink, pompom-shaped blooms from July through September. Bee balm will grow in a variety of soil conditions, but prefers dry to medium soil. Prevent powdery mildew by planting in full sun and spacing plants 2-3′ apart. 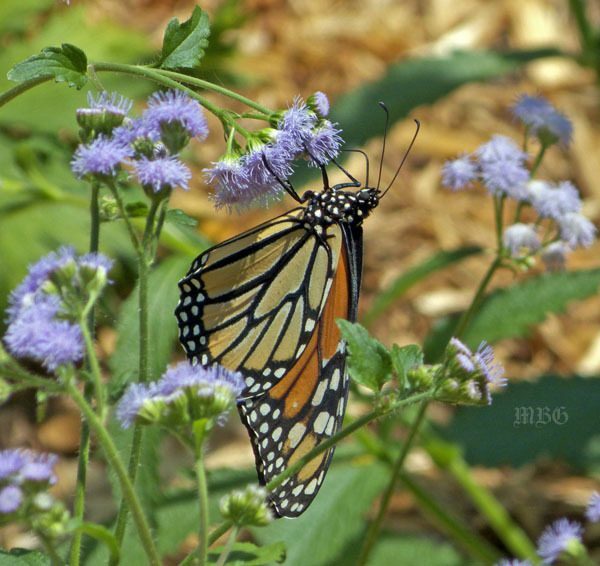 A hardy ageratum that is so appealing to monarchs, they don’t mind coming down to ground level to feed on the blooms. It does seed a lot, but the volunteers are easy to pull and the results…well worth it! C. coelestinum native region US: Eastern U.S. This hard to find, less hardy ageratum is a popular migration stop for many monarchs during their long journey to the mountains of Mexico. For more info about Gregg’s mistflower check out its plant page. Purple ruffled flowers with jagged white edges are attractive to bees and butterflies, as well as the gardener. 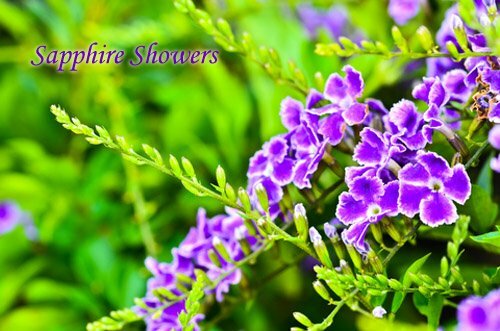 AKA Duranta repens, ‘golden dewdrops’, or ‘geisha girl’. Must be overwintered in cold weather climates. Worth the effort! 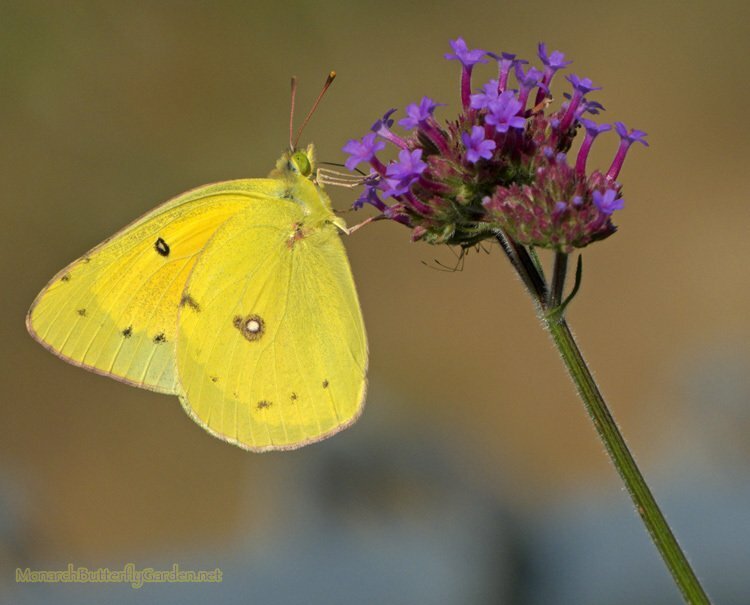 This Canary Island native has become a popular butterfly garden plant on the California coast. It can eclipse 8 feet. The beautiful purplish blooms with red stamens are popular with bees and butterflies…especially monarchs! This plant is also drought tolerant and does well in poor soil. I am overwintering this in Minnesota to see if it can be a successful butterfly plant for colder regions. I’ll be sure to post my results next season. This liatris species was sent to us by mistake when we were trying to supplement our liatris ligulistylis (listed below). The main differences are that aspera only grows to four feet and it blooms about a month earlier. 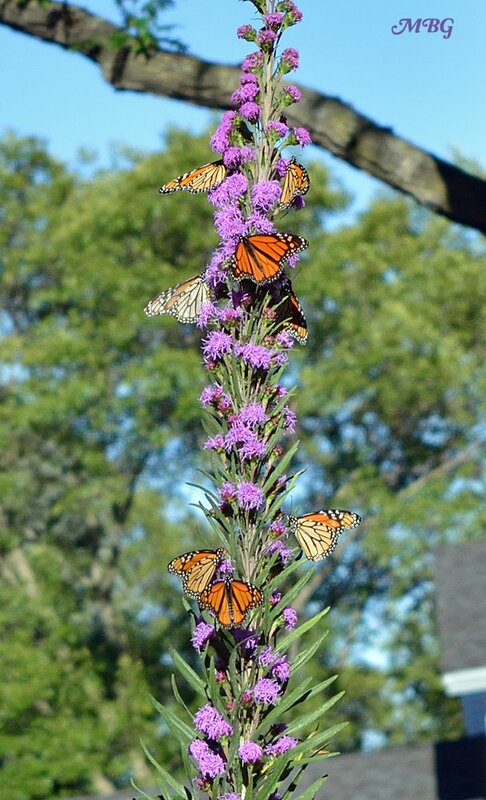 Having both liatris species is fantastic because aspera attracts summer monarchs, while ligulistylis is blooming when the monarchs start to swarm for the great migration. Having both varieties is one of the best mistakes that ever happened to our garden! Many refer to this liatris as the ultimate monarch magnet. 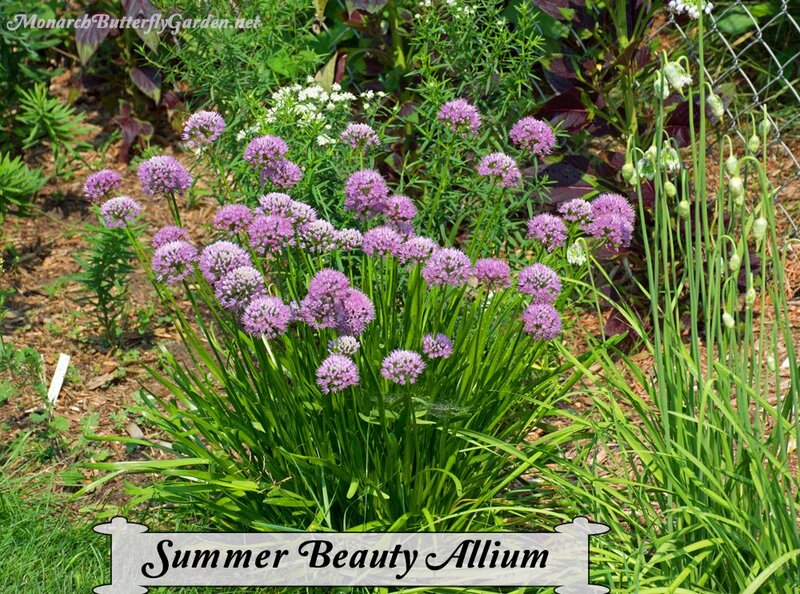 Its tall and showy purple flowers send monarchs into a frenzy. The first time I witnessed this magical effect was at a crowded state fair where a couple dozen monarchs braved large crowds for this special migration treat. 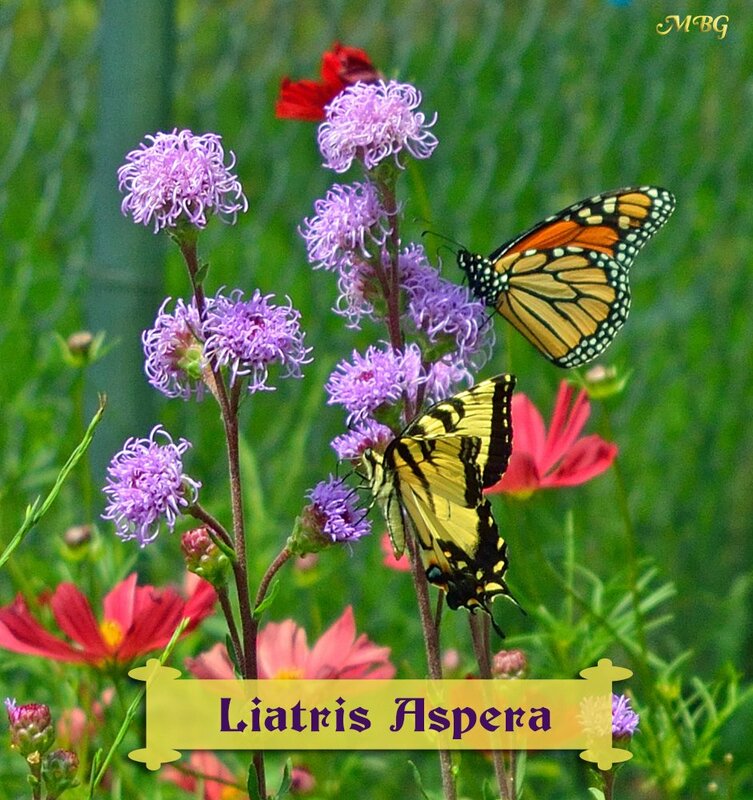 Find out more about this amazing liatris species here. 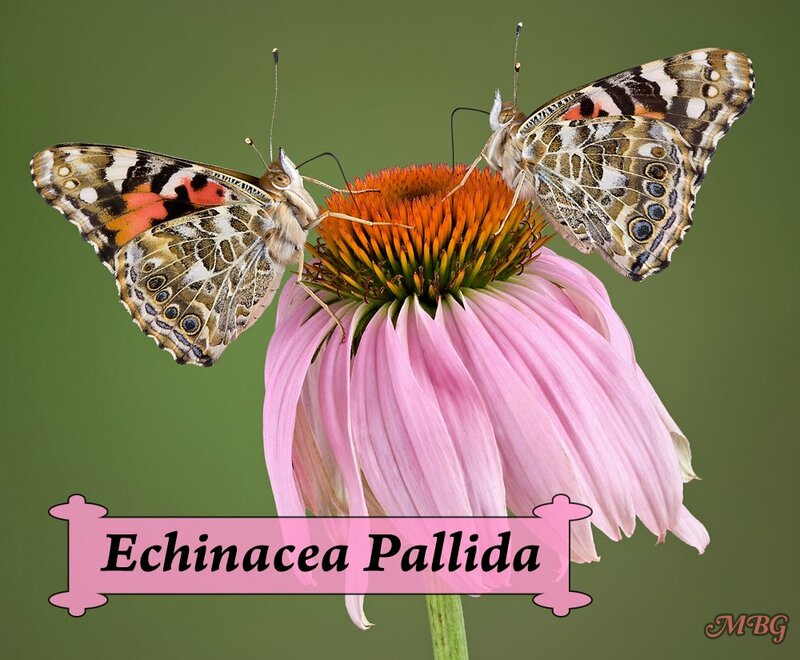 We recently added this to the butterfly garden and were pleasantly surprised to find this is another strong competitor for the coveted ultimate monarch magnet title. L. scariosa blooms a bit later than its meadow blazing star sibling posted above, which means we’ll have prime liatris blooms through the end of September. This species has very showy blooms and a slightly thicker stalk. 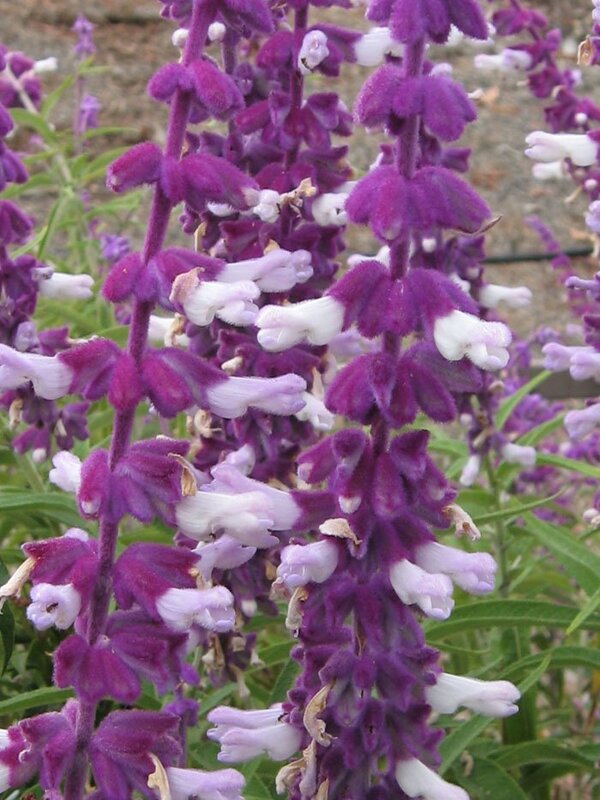 A salvia with fuzzy purple blooms, white blooms, or a delicious combination of the two. A superior porterweed species for attracting monarch butterflies, and even some typically red-loving hummingbirds. It seeds in warmer regions and can easily propagated with stem cuttings. This monarch favorite is also constantly visited by a large variety of butterflies, bees, and birds. Brazilian verbena probably has the largest variety of pollinators in our northern garden. This is a butterfly plant no garden should be without. 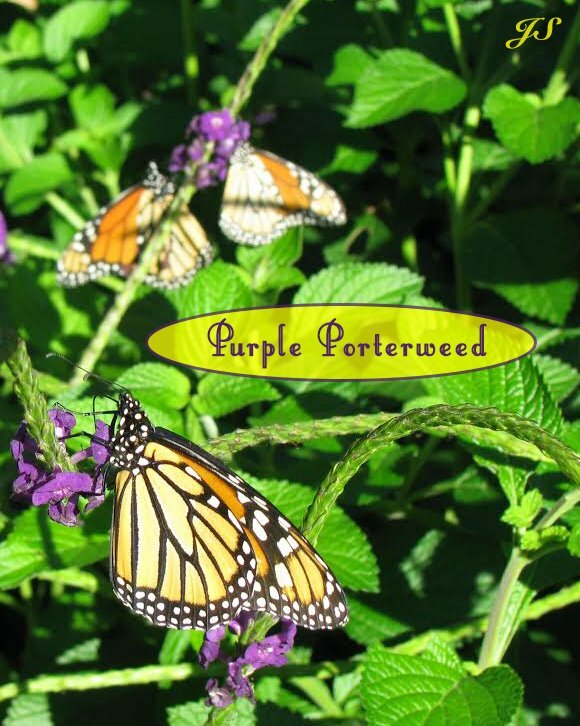 Popular purple perennials and annuals that make more monarchs come to you! 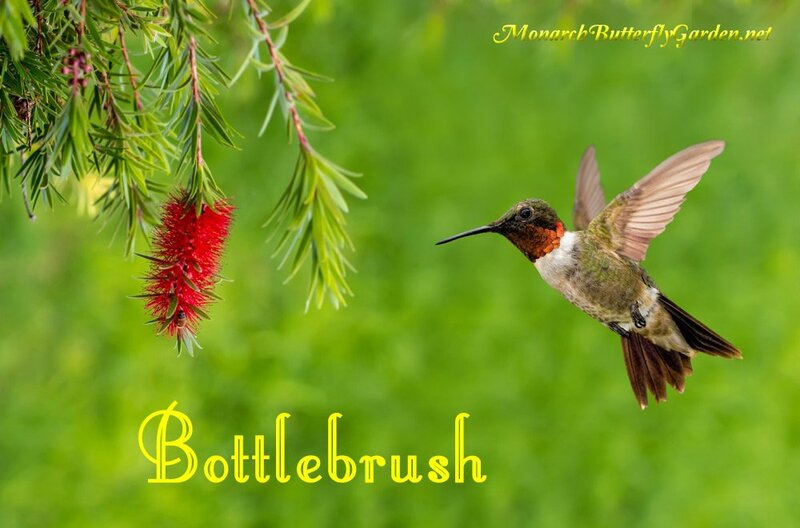 Bottlebrush is native to Australia, but grows well in warm regions of the US attracting monarchs, other butterflies, bees, and hummingbirds. The brilliant red blooms are on display from spring through fall. In colder regions, it can be overwintered indoors. Callistemon species can grow to 10 feet, but smaller cultivars are available. While there are many new cultivars and hybrids, butterflies and pollinators seem to prefer sipping nectar from this early heirloom variety. This is not commonly available in nurseries. Hybrid varieties tend to have contrasting centers but the heirloom variety is closer to a solid red. 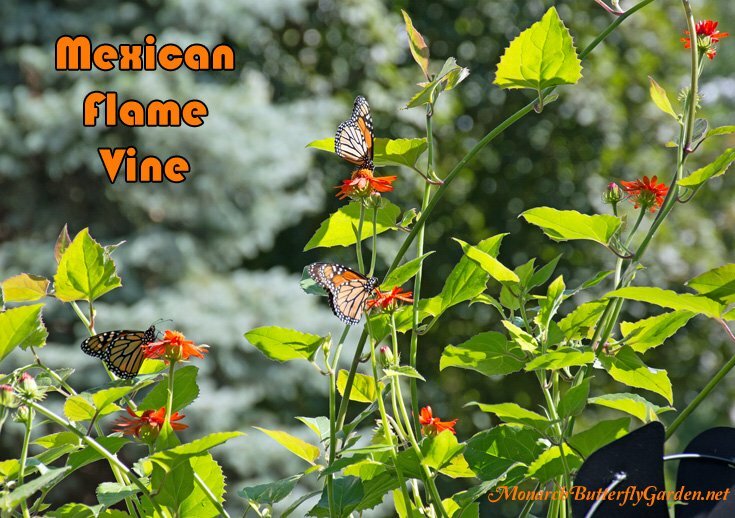 If you want to attract a bevy of bees and monarchs to your butterfly garden, make sure you buy this plant by botanical name. It’s often confused with Agastache foeniculum (anise hyssop) which grows much shorter and only attracts bees. This eastern native flowers July-September and bloom colors range from light pink to white. native region US: Eastern U.S. In northern regions, this bright white allium blooms during the height of monarch season in late summer. It also attracts other butterflies and beneficial bees…a great all-around pollinator plant and an edible herb for you too! These unique, white native flowers bloom in summer and are a favorite nectar flower of swallowtails, bees, and other beneficial pollinators. These monstrous beauties can tower to 12 feet! They produce an abundance of nectar for butterflies, and lots of seeds for their bird-brained and human garden companions. native region US: Native to the continental U.S. 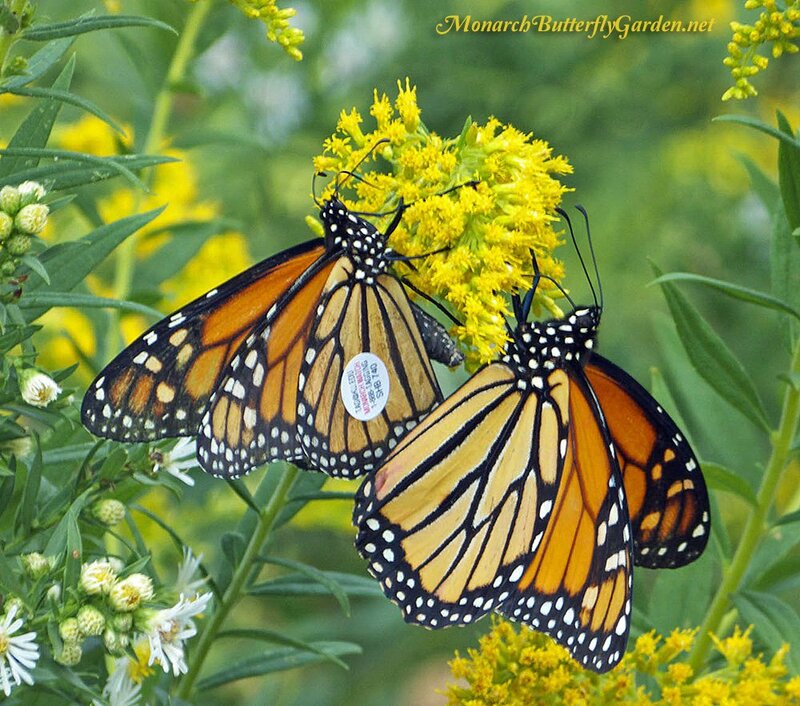 There are many species of goldenrod, but this species is reported to be a particular favorite for migrating monarchs. It also attracts other butterflies and beneficial pollinators. native region US: Majority of Eastern U.S. If you want to attract monarchs, try planting the traditional variety, but the ‘Denver daisy’ adds more visual pop with its contrasting maroon halos. It attracts other butterflies (like the buckeye above) and bees. Birds also feast on the seeds. This has reseeded in our garden for years, but never become invasive. 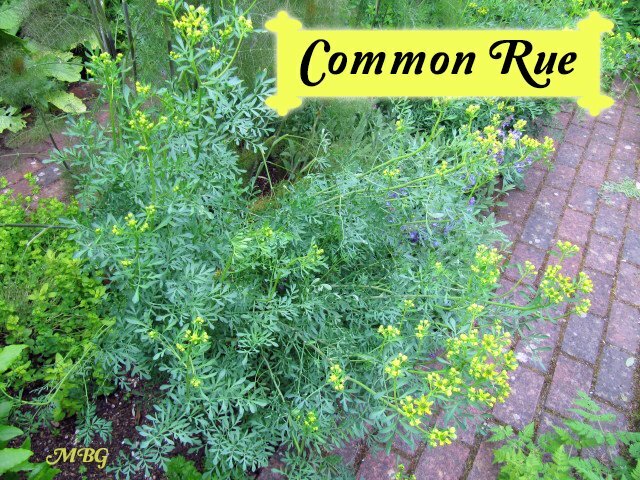 Grow annually or as a short-lived perennial. Drought tolerant. This giant coneflower variety attracts pollinators with a bright mass of yellow flowers along with sweet nectar that’s an absolute favorite for bumble bees. Monarchs love this late blooming butterfly plant too, as they stock up for their long fall migration. Marigolds are a brilliant addition to any garden for the bright pop of color they provide all season long. 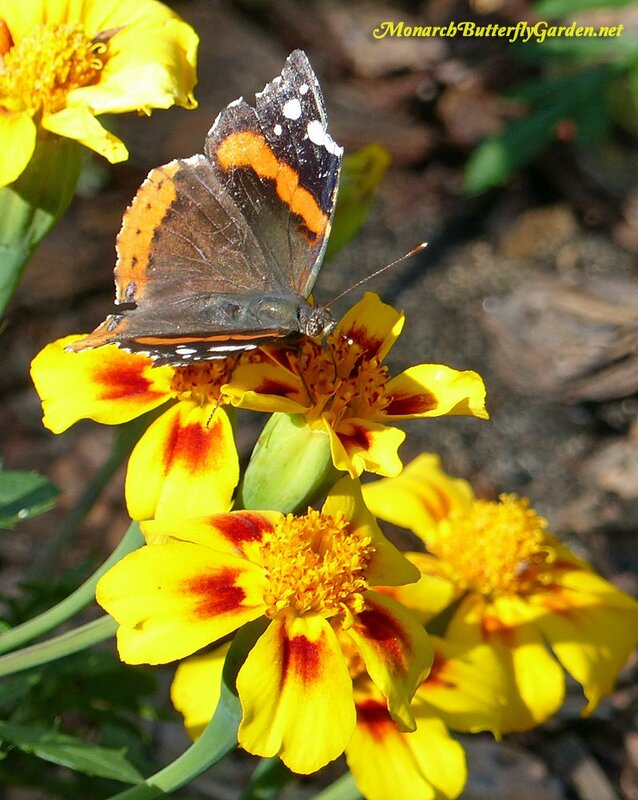 While most marigolds attract some butterflies, we’ve noticed more visitors on the single flower varieties. Lantana is a continuous blooming annual for most regions, that comes in a variety of sizes, growth habits, and colors. A trailing lantana variety with intense purple blooms. A great choice for spilling off raised beds or growing in hanging pots. Grows well as an annual plant in colder regions. Click for more info on luscious grape lantana. 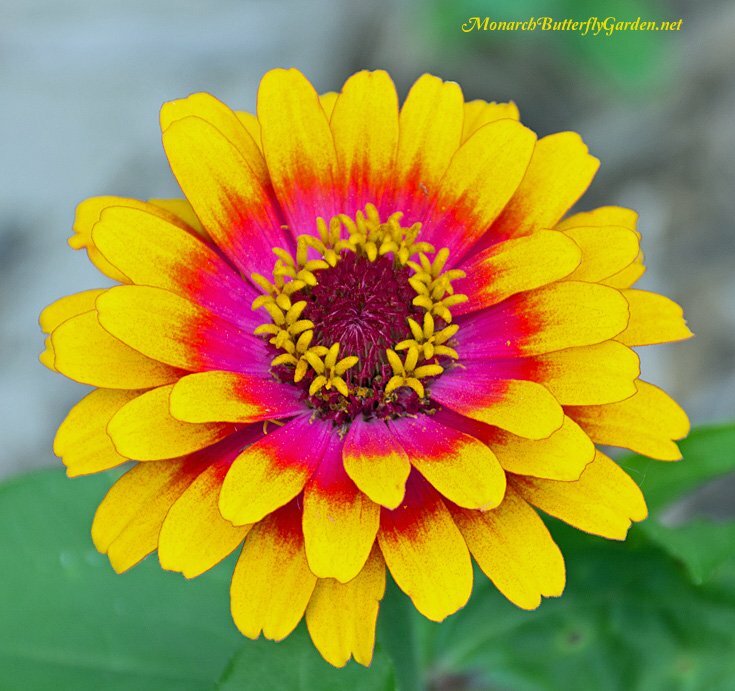 Zinnias are annual flowers that can be grown throughout North America. 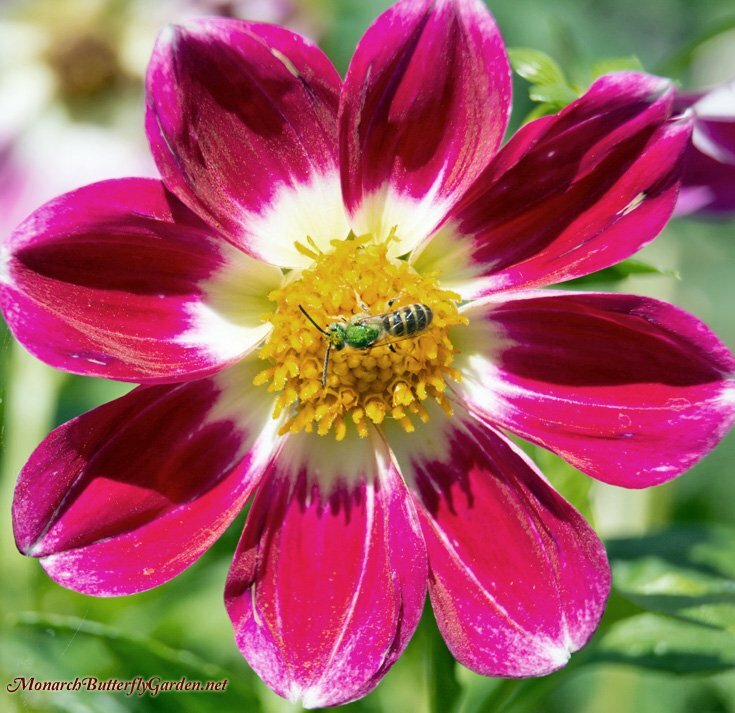 They are favorite flowers for many pollinators and will add an explosion of vibrant colors to your garden landscape. Never say never to double blooms. For some reason, the butterflies don’t seem to mind the extra effort it takes to steal a little nectar from the mostly double blooms of benary giant. 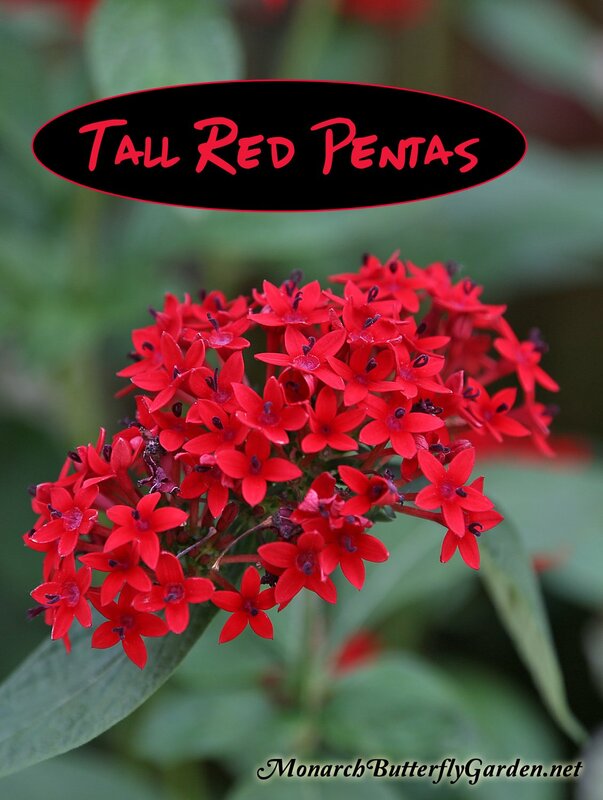 These also come in a wide variety of eye-popping colors that will attract butterflies and other pollinators. 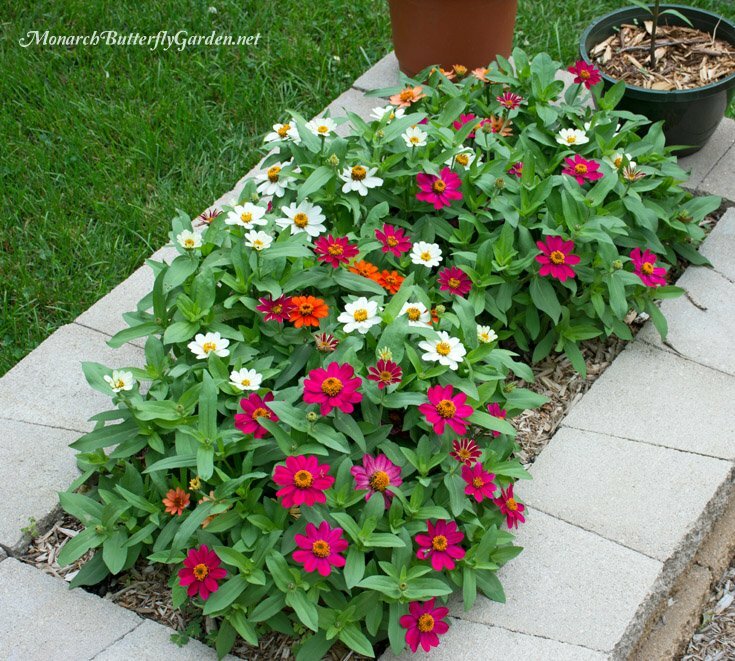 Profusion Zinnias are dwarf zinnias that come in a wide variety of colors including yellow, white, fire, cherry, orange, and pink. They are more resistant to powdery mildew than larger zinnias. 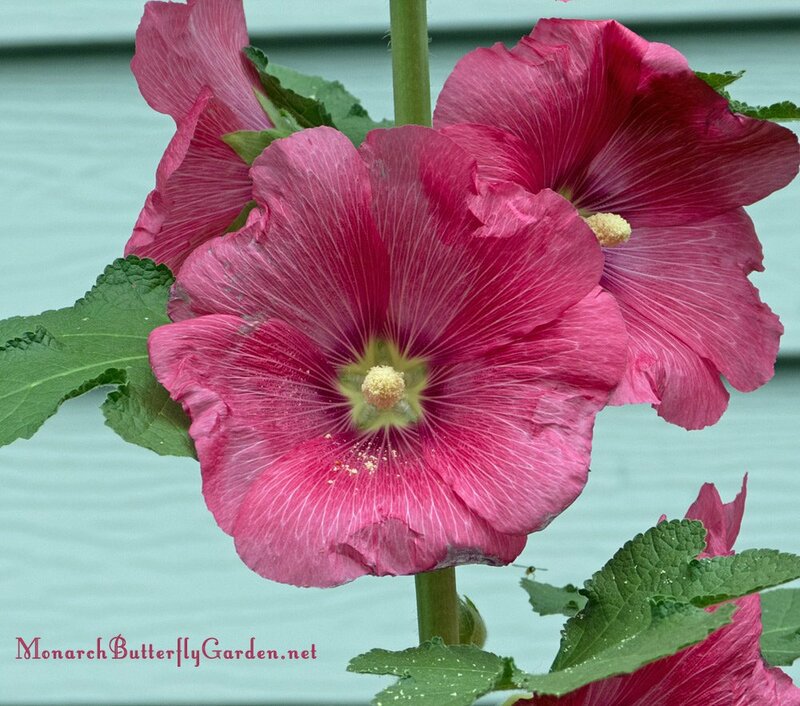 Makes a great choice for borders, potting, and raised beds. Pink, Red, and Yellow come together in a blaze of glory. Make sure to buy these annually from a reliable seed vendor. If you collect seeds from your garden, you’ll be disappointed to find the zowie has been replaced by faded pink flowers. The leaves are prone to rust, but you can treat the fungus early and/or preventatively with a hydrogen peroxide mix, space plants to allow good air flow, and water at the base of the plants to avoid excess moisture on the foliage. Perennial region US: throughout most of the US, but tough to grow in dry regions. 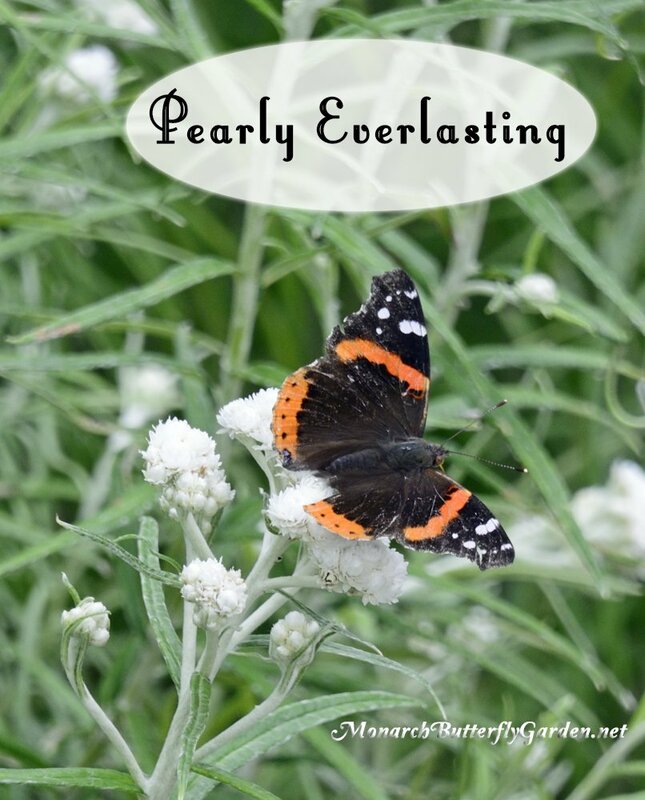 Pearly everlasting is one of our earliest blooming northern butterfly plants, and typically the first host plant to receive butterfly eggs each season. 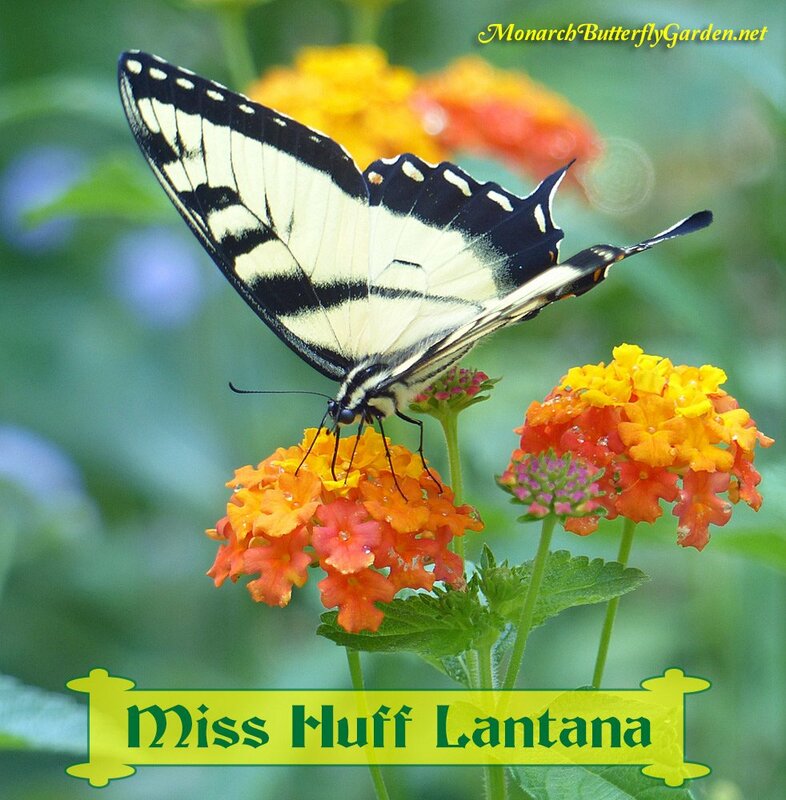 A must-have butterfly plant addition for attracting American Ladies and their offspring. perennial region: USDA hardiness zones 3-8. There are over 30 milkweed varieties that can be planted in North American butterfly gardens, and at least one variety will be perfect for your region. 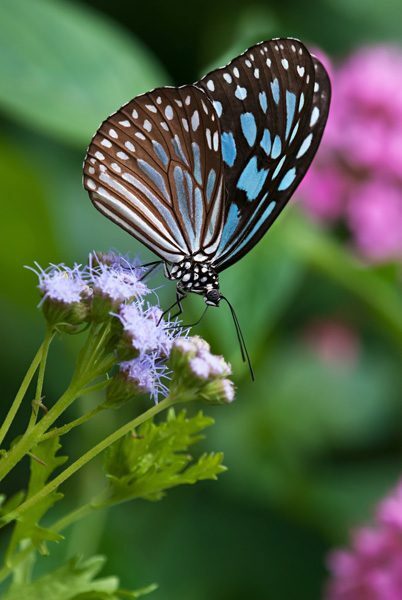 A must have butterfly plant if you want to attract American ladies to your garden. 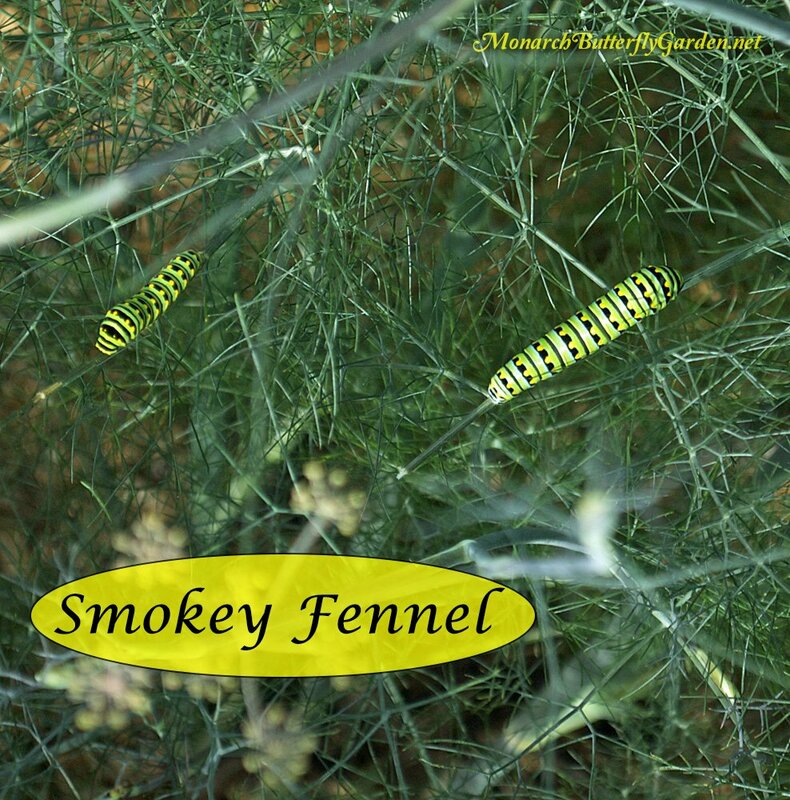 Bronze ‘smokey’ fennel is a preferred host plant for eastern black swallowtails. It’s attractive purple-tined foliage has the taste and aroma of anise or black licorice. The summer blooms are a wasp favorite, so plant accordingly or try another black swallowtail host plant. perennial region: USDA hardiness zones 4-9. This vigorous climbing vine supports gulf and variegated fritillary caterpillars. It also puts out some of the showiest blooms you’ll see in a butterfly garden, eventually yielding a harvest of edible passion fruits that have been reported to taste like guava. perennial region: USDA hardiness zones 5a-9. 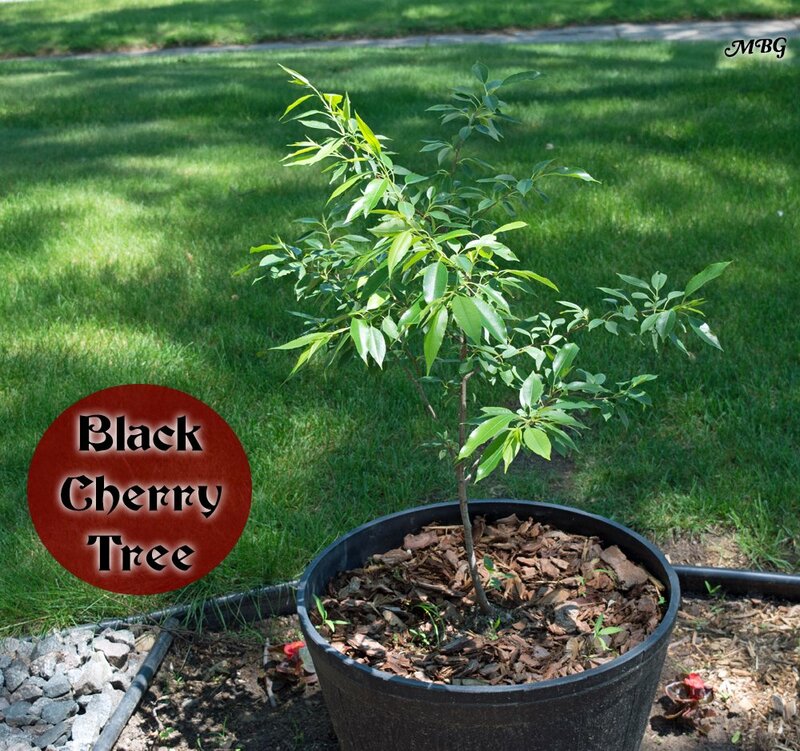 If there’s no room in your yard for a 70 foot giant, try growing your wild black cherry in a large container. perennial region: USDA hardiness zones 4a-8b. A good host tree option for easy caterpillar access since it stays under 20 feet. You can also grow this height-challenged prunus species in containers. It’s a host plant for Eastern tiger swallowtails, Lorquin admirals, and Two-tailed swallowtails. perennial region: USDA hardiness zones 2-7. Another host that conveniently stays under 20 feet. Its musky spring blooms are a pollinator favorite, and it’s also a caterpillar host for both eastern and giant swallowtails. Pictures to come as our stick matures. perennial region: USDA hardiness zones 4b-9b. A small citrus butterfly plant that hosts black swallowtail caterpillars, as well as the caterpillar that transforms into the largest U.S. butterfly. perennial region: USDA hardiness zones 4b-11. The Northern Prickly Ash (Zanthoxylum americanum) is a Host Butterfly Plant for Giant Swallowtail Butterfly Caterpillars. 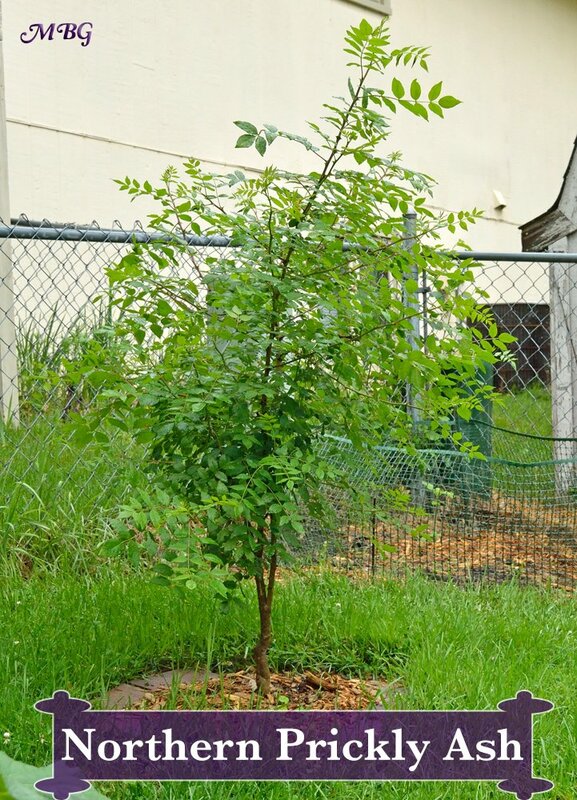 This bush-like tree is a good option for those growing with less space, since it grows to only about 20 feet high. You can also keep it smaller by cutting it back. perennial region: USDA hardiness zones 3a-7b. This lesser-known member of the carrot family grows 2-3 feet high and puts forth small, sunny blooms in late spring. It is a host plant for eastern black swallowtails. If you have problems with rabbits make sure to place a barrier around your plants, or you’ll be pulling out your hair like Elmer Fudd. 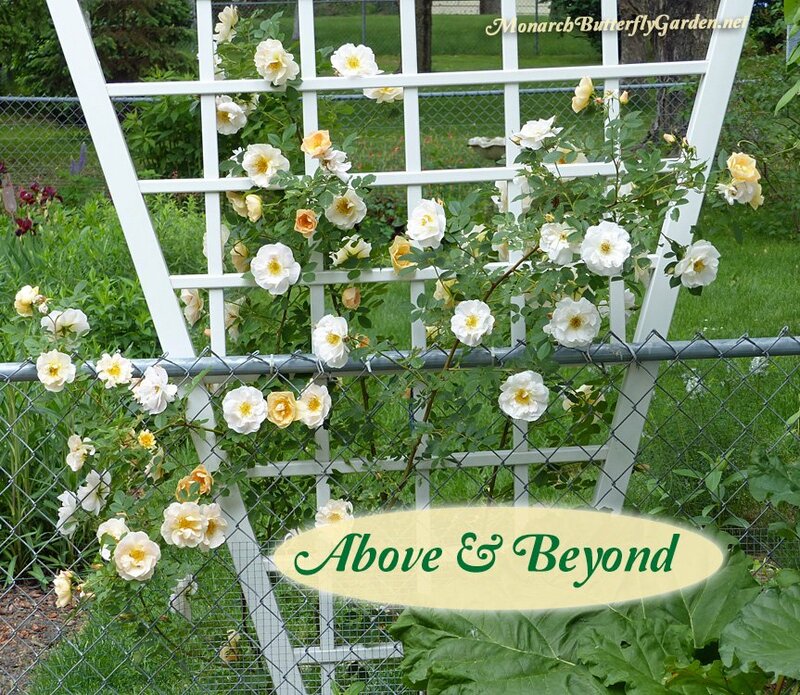 This sweetly-scented climbing rose blooms prolifically in spring and can be trained to climb an arbor, pillar, or garden trellis. To our surprise, the white and apricot blooms have been an early bee favorite, so plant this spring beauty to support your local pollinators. The white mass of flowers pictured above is from just one plant. The false aster flowers bloom from September into October and are covered with late season pollinators. Even monarchs stop to nectar on it, though it is not one of their favorites. To avoid flopping stalks, cut your boltonia back by a third in late spring. They are also fast growing annuals started from seed. 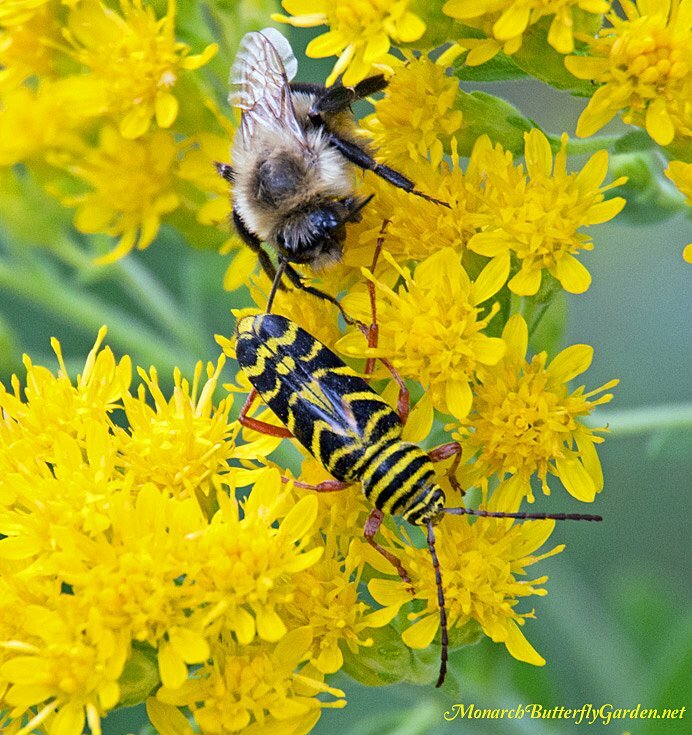 If you’re interested in supporting late season bees, showy goldenrod is always filled with them and other strange, amazing pollinators. The bright yellow blooms will also get infrequent visits from migrating monarchs. I highly recommend this plant if you’re looking to support late season pollinators. In zone 5 these don’t start blooming until October, which could be an issue in seasons with an early (or even average) freeze. Planting in zone 6 and up gives you a better chance for a spectacular bloom season. 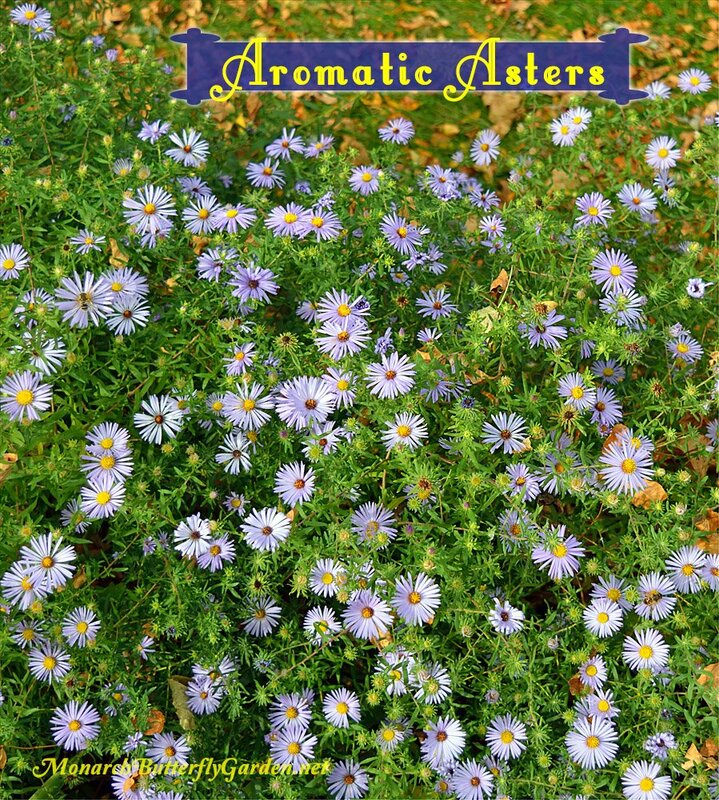 Growth is bushy and compact with aromatic asters topping out at 2 feet. 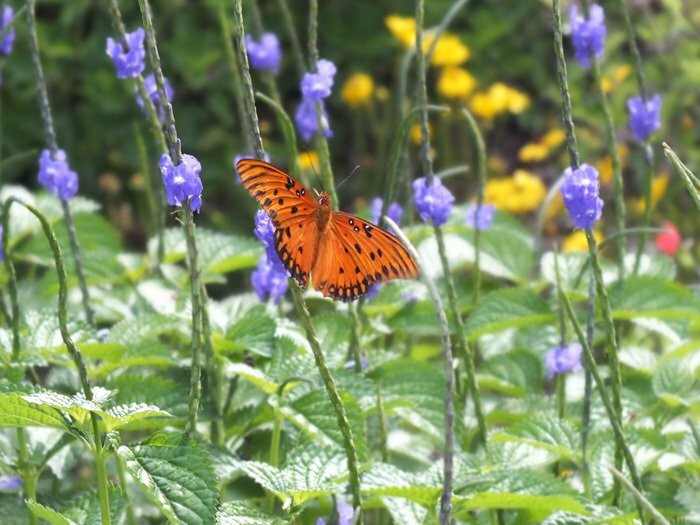 This butterfly plant earned its common name for its balsam-sented foliage and not because it has aromatic blooms. 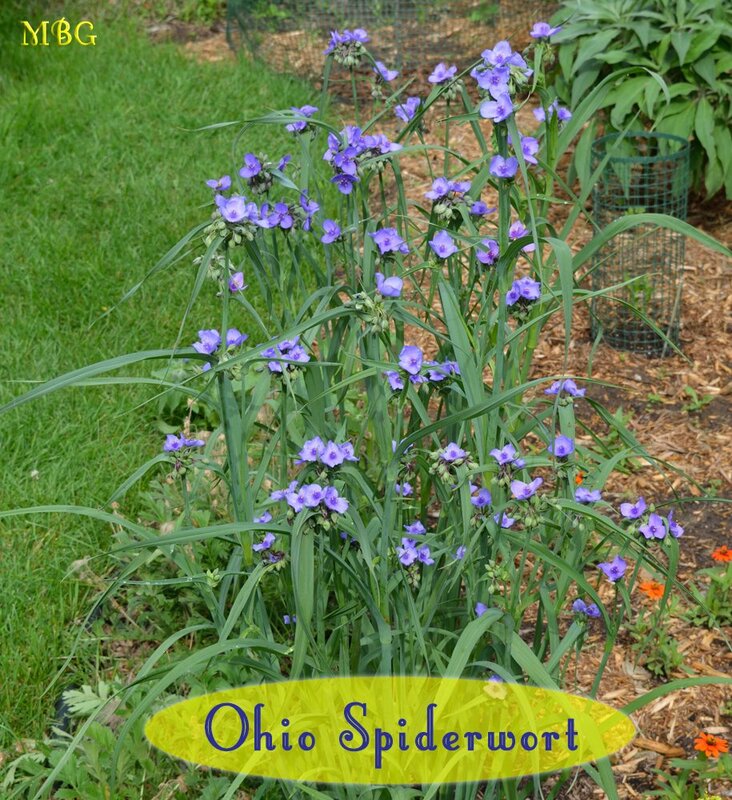 Ohio spiderwort puts out a profusion of purple blooms in the morning, then fades as the day starts to sizzle. They’re a popular destination for bumble bees in our garden. Try Four O’clocks as a companion plant since they’re on polar opposite bloom schedules. I’m not sure what’s in your area, but two of our best resources in Minnesota are spring plant sales. Since these sales come once a year, there tends to be more variety. For those of you who prefer natives, a large percentage of plant sale plants are locally grown natives…at least from what I’ve seen. Nectar Seeds and Plants to help bring home the joy of butterflies. Beautiful, unusual, exotic and native plants for butterflies. This is one of my favorite eBay vendors with a bounty of affordably priced butterfly plants and milkweed during the spring and summer months. 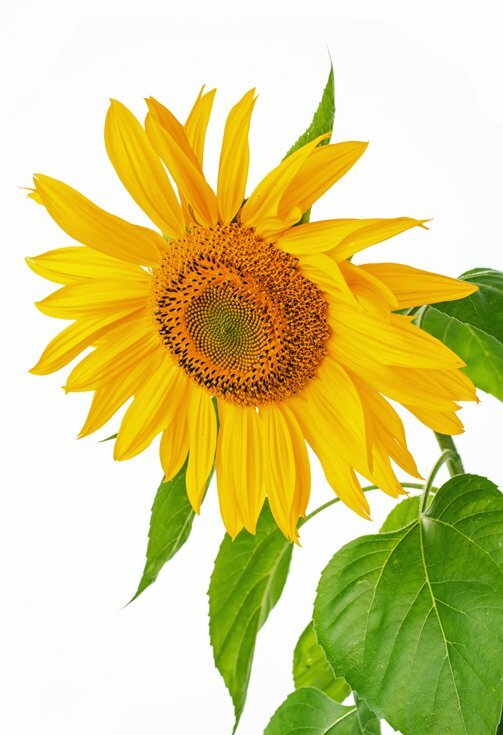 eBay is an excellent resource for nectar plants and seeds. You’ll find better options if you search for specific plants. Please check a seller’s feedback rating before purchasing. If a seller has a feedback rating below 97% I look for other options. Amazon vendors have plenty of nectar to offer too. You’ll find better options if you search for specific plants. Please read Amazon reviews to make sure you are buying from a reputable seller. A third marketplace to find butterfly plants from both nurseries and home gardeners. Look for specific plants for best results and read customer reviews. This nursery specializes in nectar plants that attract monarchs and more. 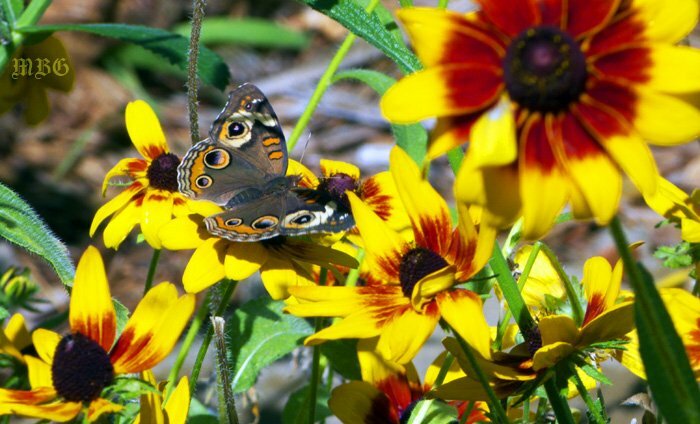 Search for native butterfly plants at local nurseries near your home. Wanted to post this under “growing milkweed in containers” but didn’t see the leave a reply box there. Anyway, I have several potted milkweed plants on my 2nd floor condo balcony and am starting to find eggs! Wasn’t sure if the Monarchs would find the plants up here but they did. So, for anyone else without a yard; yes, you still can have Monarchs. Plant it (even up high in pots) and they WILL come! Bugs are eating up my butterfly garden. White flies, aphids, etc. Do you have a solution to this problem that will not affect the butterflies, eggs, caterpillers, and their cocoons? Butterfly list is very helpful. Good butterfly hunting this summer! How about the genus, Calotropis (Calotropis gigantea, Calotropis procera), the Giant Milkweed/ Crownflower? It can be grown as an annual in northern regions. The Monarchs (caterpillars and butterflies) are crazy about it, both as a host plant, and as a nectar source. Hi, I want to grow some nectar plants besides meadow blazing star for monarchs. I don’t have too much extra space, so what other plants have you found to attract the most monarchs? Also, is there a garden center/plant nursery you recommend for pesticide-free plants (as I do not want to start from seed if possible)? I live in zone 4 MN. Thanks! Hi Kris, those are all good nectar plants , but joe pye weed weed can take up a lot of space depending on the variety you get. Will Eastern Tiger Swallowtails use “Syringa pubescens” also know as Manchurian lilac or Miss Kim Lilac as a host plant to lay eggs and feed Eastern Tiger Swallowtail caterpillars? I have a butterfly garden and I am hoping to raise some Tiger Swallowtails. I’ve been looking everywhere for some Aristolochia (erecta, reticulata, wrightii, and coryi) and I’m not having any luck. Do you have any suggestions for plants or seed sources? I would be so excited to grow them! Hi Vela, I’m not familiar with any of those. With hard to find plants, I check ebay periodically. You never know what unexpected gems will appear…good luck! Hi Larry, pearly everlasting is a nectar plant for lots of small pollinators and, less frequently, butterflies. It’s a preferred host plant for american lady butterflies. I’m planning on planting flowers that will help attract monarch (and/or any native michigan) butterflies in my schools back field for a project, but the problem is that there’s a lot of deer in the area that has eaten past students plants. My teacher already has a plan on how she’s planting the milkweed but I’d like to know: Is there any types of flowers that monarch butterflies will like and deer won’t? A giant swallowtail flew into my house today (January 14th). I researched it and figured out that it likes sunlight. It seems injured but can fly, and it won’t go outside. Currently, I’m using a lamp to simulate sunlight and I’m putting honey for it (which it won’t drink). What else can I do to help it? Hello, my name is Madison and I would really appreciate some help, I’m starting a small monarch garden next year so right now I’m planning on what plants I’m going to use, is there a certain flower monarch mothers like going to more than others? I’m hoping to plant milkweed near it so I need a flower that also grows well beside milkweed. ( I’m planting them near each other so if an expectant monarch mother flies by for something to eat she might lay her eggs on the milkweed, tell me if that is a wise choice please. ) Thank you! Ok, I’ve made all my plans and am going to buy some flowers and milkweed next spring, I can’t wait join you guys in helping monarchs! Please give me a list of Fall flowers (perennials) for my late butterflies…I have Monarch caterpillars but not nectar flowers left for the to feed on, before moving on, and most all of my other butterflies have also disappeared because of this. thank you for your help. I would love Fall bloomers into Winter. Where did you get your northern prickly ash and is there anywhere that is selling them now in MN? Hi Shannon, I got them from Outback nursery in Hastings, Mn. hopefully they can help you out! I’ve got one of these trees. Have been considering starting cuttings. Would anyone be interested? I bought 3 natural milk thistle plants from our local nursery. for some strange reason, the caterpillars on one of the plants keep dying. It is close to a Jasmine tree and I’m wondering if the Jasmine has a natural pesticide that hurting the caterpillars. Hi Rhonda, I’ve never heard of any issues with planting (milkweed?) next to other plants, and some jasmine species are butterfly host plants. Your local nursery may have purchased its stock from a grower that uses herbicides on its plants to prevent pests. Very common. You have to ask about the practices. Another issue may be that it’s an inappropriate plant for larvae. 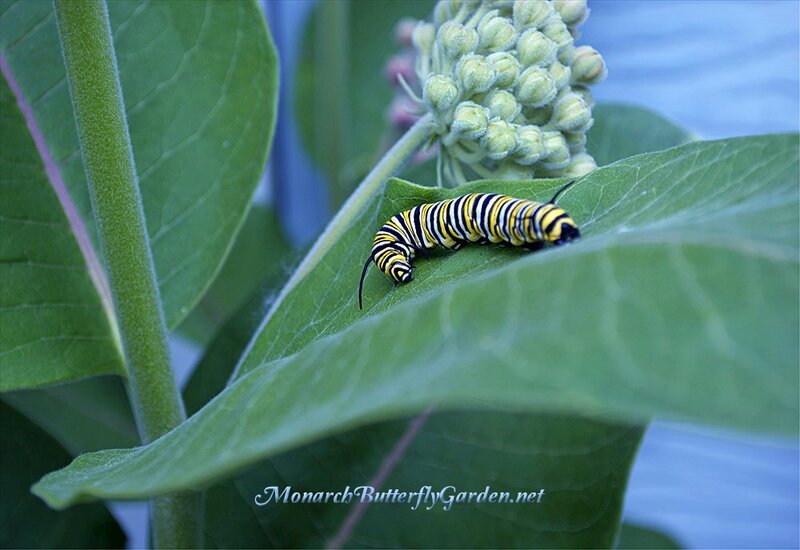 I heard there are false milkweeds that the caterpillars will eat but not make it to adulthood. When my flowers were on a table in my backyard, butterflies actually came to them. After I planted them into the ground, I haven’t seen any butterflies come to the garden since. They come to a mimosa tree I have in the backyard, but nothing else. Do they not like how low it is? None of the plants are taller than a foot and a half or so. Is it something with the dirt? Would getting more plants and putting the table near the garden help? congrats on all your success Linda, and good luck with all your future raising efforts! We had a wonderful weekend here in Detroit with temperatures in the mid 60’s yesterday. All of our snow has melted, the spring bulbs are slowly starting to sprout, and even though it’s early, my thoughts are now turning towards what new nectar plants should we try in the garden this year. I was wondering, have you ever tried to grow ironweed? We are thinking of trying Missouri ironweed (Vernonia missurica) this year, and I read that it is an attractive plant when it is in bloom, and one of the best attractors of late summer butterflies. The article went on to say that monarchs, swallowtails, painted ladies, and cabbage whites are frequent visitors to the flowers. As an added bonus the article said that bunnies don’t like the taste, so ironweed sounds like the perfect fall blooming plant for butterflies and other late season pollinators. Thanks in advance for any information you can give me on this plant. Hi Brian, we have a couple Vernonia fasciculata (prairie ironweed) and they don’t get much attention from butterflies in our garden. If they don’t do anything this season, they are getting pulled. missurica might be a more attractive species to the butterflies, but I don’t know anything about it…good luck! Can someone please provide me with a list of good nectar sources for monarchs here on the West Coast of the US? This list is so spread out that I cannot make a usable list for my students. I will cut and paste if you can send any type of list in your reply. THANK YOU so much!! I was looking for pygmy butterfly info. I have had one off and on for the last 2 months and today I saw two flying together. I live in zone 5 in northern Ohio. What is drawi ng them. This is the first year I have ever seen any that small–half the size of a white cabbage bf. Their marking, when sipping are similar to me of a monarch. Thanks for any help. hi Barb, I am not familiar with this species of butterfly. In this instance, I would suggest seeking out a butterfly group (butterfly enthusiast) on facebook for more info. good luck! FYI my bottlebrush buckeye has the most butterflies of any of the plants I have (when it is in bloom). Its another great one you should list on this lovely website! Hi Tony, We found our first monarch caterpillar EVER on what I call butterfly weed by our decorative pond this morning. Should I move it to a more traditional milkweed? We have lots of milkweed, phlox, joe pye weed in the garden. Congrats Ina, If there are enough leaves on the current plant, the caterpillar doesn’t need to switch to another milkweed variety. Hopefully that will be the first of many! I have two questions. I don’t know whether they have been talked about here or not. #1. My daughter (lives in SE Wisconsin) sent me seeds from her milkweed (I live in SW Missouri). I planted them and put the pots in the garden to winter over as you suggested.) I got 13 which came up. Since then, I’ve transplanted them in my NEW butterfly garden and they are doing great. Unfortunately, I don’t know the species. My question is – will they bloom the first year? Do they multiply from seed or from root systems or both? #2. I saw my first Monarch migration in many years last fall (most likely due to the butterfly bush I had planted). I have 5 this year. How do the butterflies (caterpillars) know where to find the milkweed? By sight, smell? I have the milkweeds scattered through the garden in groups of 2-3 in a bunch. I can’t remember the last time I saw milkweed here. What do the Monarch butterfly eggs look like? The butterfly garden we did this year is 4′ x 32″. I have 5 butterfly bushes, Monarda, Gailardia, Asters, Phlox, Echinacea, Liatris, Coreopsis, Scabiosa, lillies, lavender, parsley, chives, pineapple sage, sedum, verbena, marigolds, button flower, Pentas, lantana and a geranium. Next year I hope to add Joe Pye weed. Should I add more types of milkweed that would do well for this area? Oops, I think that was more than a couple of questions. I guess I should get to reading more – but sometimes all the info just seems overwhelming. I did see a lone Monarch flying around the front yard yesterday. The butterfly garden is in the BACK yard! Thanks for any help you can give this “old, senior citizen”! Monarch females have sensory organs on their feet so they can tell milkweed from other plants. They locate milkweed from sight and scent. Agastaches of the blue varieties (Blue fortune, Boa, etc) almost equal butterfly bush as an all around pollinator draw for butterflies and bees. They fade early September in northeast Indiana (zone 5b). Butterfly bush with good dead heading pushes out highly attracting flowers to the end of September. 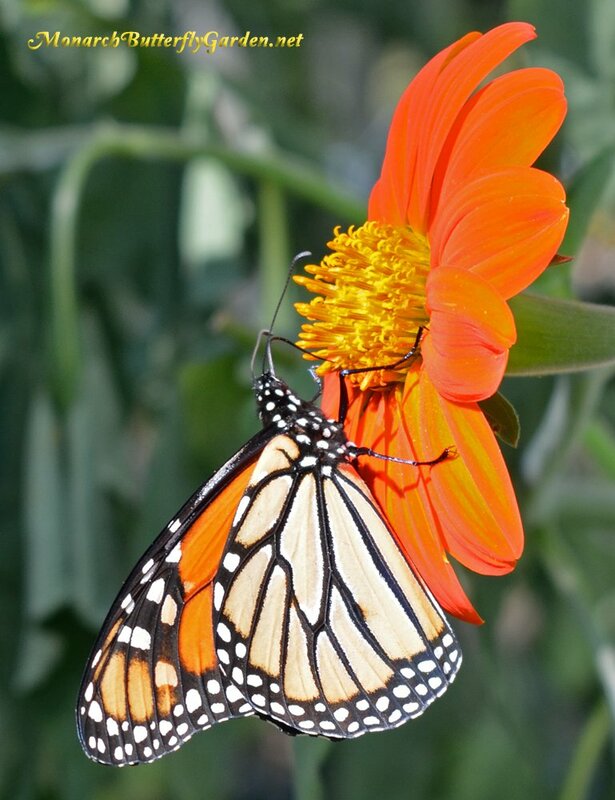 Mexican sunflower (an annual) is very effective for Monarchs (and hummingbirds, bees) and flowers until frost which covers the later September zone. 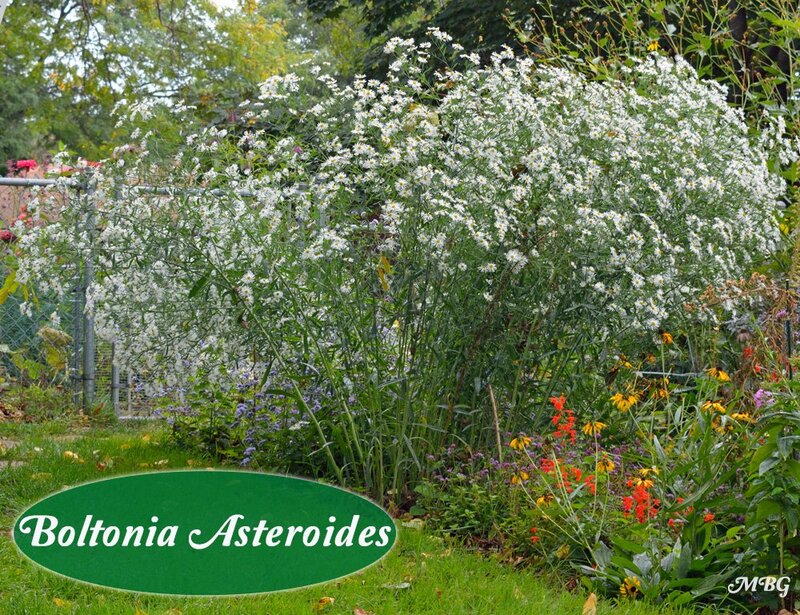 Asters and Blazing star also help fill in the later pollinator zone of September to October. Does the prickly ash have massive thorns? I have found a shrub like tree in an abandoned subdivision and i’m not sure what it is. I’ll try and get a picture today. yes Kali….another reason to cut it back and “mold it” so it’s not in the way. I am retired from my horse farm. I have made an area of about 1 1/2 acres where milkweed naturally grows for the purpose of a butterfly garden. The farm is 100 acres 80% wooded and 20% hay/pasture. My question is would it be wise to put a couple of Mimosa trees near the garden? I have a Mimosa in my yard and it attracts many butterflies as well as hummingbirds. I also have some acreage with goldenrod and Joe Pye weed. This farm is a virtual wildlife bonanza. 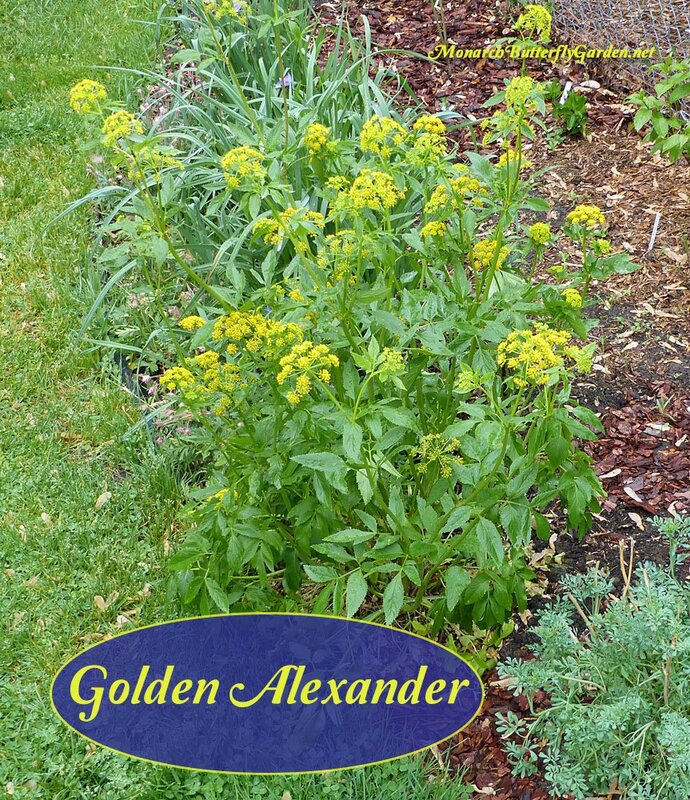 Hi Everett, I can’t think of any reason not to plant one by your garden…especially if it’s a pollinator favorite! It’s always a good idea to have a few trees close by, because that’s where butterflies retreat to in the evenings and during inclement weather. Your butterfly field sounds amazing! Incredible incredible information as always! Do you have a Twitter account to disseminate the wealth of information you provide? Our native pollinators need all the help they can get. Hi Matt, thanks for your kind words. I write from the Canary Islands, a Spain’s place where a group of people ( increasing) follow to Sonia Givray proyect called Proyecto Monarca blog with a lot of info, Spanish language). Now I try to add to the Asclepias other plants: the Gomphocarpus Fructicosa and Calotropis Procera (now in seedbed), other member of this proyect have been successful with these plants for breeding Monarchs. Hi Eloisa, I wish you and your community lots of success supporting Canary island monarchs…Good luck with your new milkweed! Hi Linda, I look forward to hearing more about your garden this season. Good luck with your winter sowing! I just have to tell you how amazing you are! I really appreciate all the information you share with me . I really like your approach. You make me feel as if I am your friend with whom you are sharing all of your Monarch raising experiences and your ways of creating a wonderful habitat for the Monarchs. I really look forward to your communications! Thank you SO much! Thanks Donna, and thank you for being part of this amazing community! Just a short note too let you know I’m planting several kinds of Milkweed in plastic milk jugs . Getting a head start . Do you know if all Milkweeds seeds need to be cool before planting ? Spring is getting closer and I’m ready to get my fingers in the soil . Hi Judy, being outdoors in winter temps is all the cold stratification they will need. Hi Tony: Just a note about my nursery for anyone in my palm beach, martin or broward county area. I specialize in pollinator plants, especially butterfly and hummingbird plants, both nectar and host. I grow all my plants without any chemicals or pesticide ever! please feel free to visit my website and I would like to know if you would include me as a nursery reference. I am also always searching out other types of milkweed to grow for our monarchs. Right now the incarnata is covered with our resident population of monarch eggs and caterpillars. Flame vines are one of my biggest sellers as are the sweet almond bush as nectar for the butterflies and the honey bees. Thanks for all you do to help our monarchs. Hi Carol, sounds like a wonderful nursery with lots of pollinator plants. I grow flame vine here in Minnesota…one of my favorite annuals. We overwinter it indoors and it is a vigorous grower..I have to cut it back every week! Currently, my resource page is for online vendors but I will send out a message if I create a page for local nurseries. Carol, what is your website? I would love to find a place to buy So. 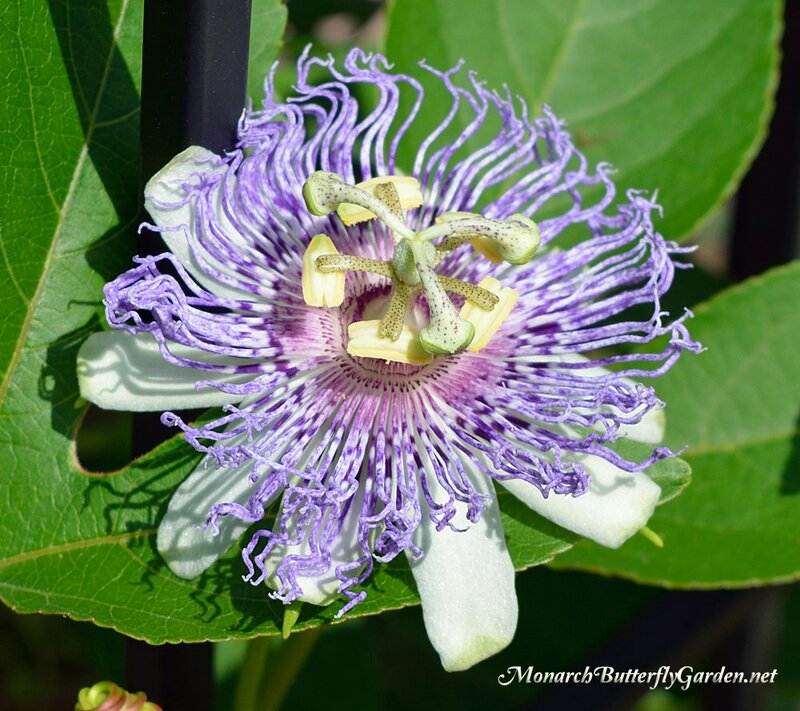 Fl plants that will support bees and butterflies w/o chemicals. I live in California Coastal region of Southern California & am raising Monarchs. It’s too cold to release them right now so I’m looking for nectar plants for them right now. My gardener cut all of mine. Any suggestions? Hi Lorraine, you can also feed them with cotton balls soaked in hummmingbird nectar. They also like fruits like oranges, bananas, and watermelon. WHERE CAN I FIND MILKWEED PLANTS OR SEED? We get our seeds and cuttings from livemonarch.com. The cuttings come with little roots already developed & are very healthy & easy to grow. An informative and helpful post here. Thank you. I’ve been trying for the past few days to ID a plant that you’ve pictured above, the one with the clouded sulphur on it: verbena! Glad I could help, Verbena bonariensis is one of our top performers every year, and most gardeners I speak with across the country seem to agree. Hi Lisett, if you check out my milkweed resources page, each variety has the states listed where it’s considered native and also its USDA hardiness zones. Gardeners in your region typically report the most activity with non-native tropical milkweed, but it should be cut back once or twice a year to avoid monarch disease issues that are linked to the overuse of plants. I live in Harvey Station, NB, Canada. NOT ONE MONARCH BUTTERFLY HERE . Not this year or last year. And yes, I still plant for them and for the bees and the birds as well. Irvings are clear cutting the forest and spraying toxic chemicals to kill all the vegetation after they clear cut. No one seems to be able to stop them. And the New Brunswick government, whether Conservative or Liberal, keeps giving them more crown land to clear cut. It is a totally VILE situation. sorry to hear this Kitt…the population is low this year so many aren’t seeing monarchs. Keep planting and in a better season, your efforts will pay off. I hope you see some this season…good luck!